John Joseph Elliott was born in Carrigallen, County Leitrim, Ireland, on December 31,1903, to John Elliott and Catherine McLoughlin, and received his elementary education in the local village school. When an economic depression in Ireland led his brothers and sisters to seek greater opportunity in the United States, John remained at home to take care of his widowed mother and the family farm. After his mother's death, he sold the farm and immigrated to the United States in 1947. He worked in various capacities, principally in gardening and maintenance in Philadelphia and Tampa, Florida. Through self-study, he earned his license as a boiler engineer and worked in that capacity for a time.In 1961, John Elliott decided to enter the Order and took the religious name of Brendan. His nephew Father James Elliott, O.S.A.. was a member of our province. 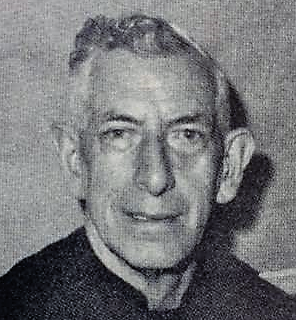 After candidacy and postulancy, Brother Brendan professed first vows on March 26, 1966 and solemn vows three years later in 1969. At Saint Thomas Monastery, Villanova, he served as porter and sacristan. In 1978, Brother Brendan was transferred to Saint Joseph Friary at Monsignor Bonner High School, Drexel Hill, Pa. In 1981 he was reassigned to Saint Thomas Monastery, Villanova. Ill health gradually took hold of him and for the last two years of his life he was bedridden. Brother Brendan was a feisty and zesty individual and enjoyed all aspects of life. He had a keen sense of humor and enjoyed telling stories, especially of his native Ireland. He was also a prayerful and compassionate man, two characteristics which were most evident in his solicitude for the sick, the suffering, and the elderly. He was especially conscientious in visiting them and praying for them. Brother Brendan died on July 17, 1986, at Saint Thomas Monastery, Villanova, at the age of 83. He is buried in the Augustinian plot at Calvary Cemetery, West Conshohocken, Pennsylvania. Newer PostJohn J. Anderson, O.S.A. Older Post Henry C. Carr, O.S.A.